This is the first level of Wild West Seymour, you start off by Richard Eddy who gives you a nasty note from El Bandeeto, then it's onwards to the Codies office and time for a quick word with Clare. Check out all the offices and then take a peek in the Shed. Before you can get off the level, you're going to have to find the nect level code and give it to the game genie. (Currently asleep in the bus's exhaust pipe!) Let's get one thing straight right away -Seymour is the scariest mother of a lardball that there's ever been. And he's got a mouth. And teeth. (He is also possibly the only mother of a lardball in existence.) The loading screen alone is enough to scare any small children or old people who might just happen to be hanging around your Amstrad. It's small thanks, then, that this is the only extreme close-up you get of the lardy one, elsewhere in the game he's of a far more comfortable size. If you've been good and read the last few copies of AA then you'll already know what Wild West Seymour's about, you'll also know what the packaging looks like, all the personal foibles of the programmers and exactly who Richard Eddy is. 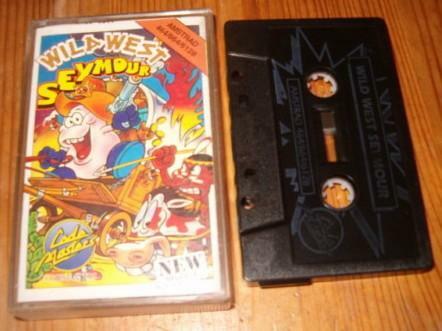 For Wild West Seymour had the honour of being the game chosen for an in-depth, month-by-month look at how a game is made - from the boardroom to the shop shelves. And now is the moment of reckoning, it's time to find out what you may suspect, but don't actually know yet - is it any good? Before we go into that here's a quick rundown of the plot, just in case you missed the last five issues of AA. (Nobody would be so stupid - ed.) Seymour is a film star and he's about to start filming a new Western. The thing is, everything has gone horribly wrong. The film's missing, the microphones can't be found and the whole production has had to grind to a halt. This must be more than bad luck - this must be the work of El Bandeeto. (The baddie.) So before the film can even start, Seymour's got to sort things out. The puzzles are clever and, however smart you are, it'll take you a while to solve some of them. (No doubt the Cheat Mode pages will soon be full of tips!) The game's pace really does depend on how good you are, there's no time limit so you won't suddenly find yourself popping your clogs just as you're about to discover what the can of beans does. In fact, you can leave old Seymour balancing on a crate while you go off and have ea. When you get back, he'll still be there twiddling his thumbs and winking. For some people the main drawback with this little caper is the fact that its a Seymour game. There's no escaping that fact, and Seymour games, like Dizzy games, are pretty much interchangeable. There's a formula to these games, but it's a welHoved formula. People know what they like and a heck of a lot of them like these puzzley, collect-'em-up games. The fans will go mad for this, and those who loathe Seymour and games of this ilk will go on about how they're all the same game and the only difference between this game and the others is what the objects do. But that's not really point. If you've ever read one Famous Five book, you're very likely to have read another. What you don't do is harp on about how they're all exactly the same and you always get the same people in them, and the adventure might be a bit different but it always works out all right in the end. Central characters, whether it be George and Timmy or Seymour and Dizzy have got to be consistent. It just wouldn't do for Dizzy to rush through New York warehouse laying waste to drug dealers, or for Seymour to suddenly develop a yearning to aim his crosshair at mercenaries. CodeMasters have stuck to their formula because they know it works. 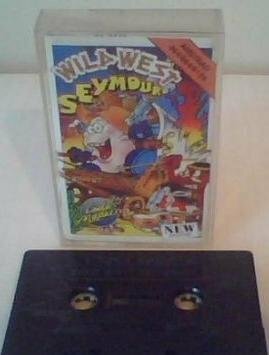 Wild West Seymour will be enjoyed just as Seymour Goes to Hollywood was enjoyed. Why? Because it's a game which will appeal to a great many games-players, and because it's a good game. Buy it! » Topic: Cheats, pokes ou solution pour "Wild West Seymour"